I just caught the Hugh Jackman starrer, Real Steel, over on my free Comcast preview of Showtime. (Comcast subscribers have some form of free access to the "Premium Channel" mode of Showtime.) And I had forgotten how fun this movie was. My first review of the movie on this site's parent site, I had found myself distracted from the sci-fi aspect and caught up in the story. 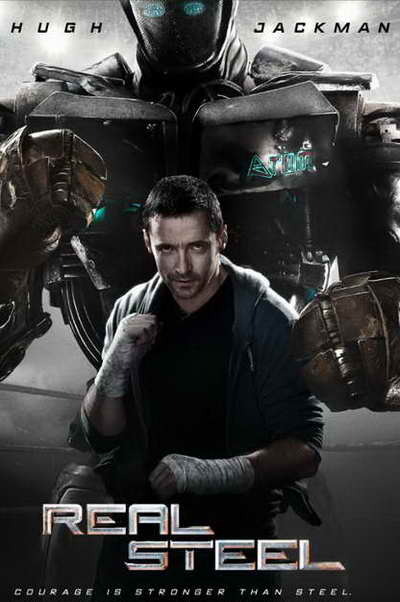 And getting a chance to revisit Real Steel was a pure pleasure. Directed and produced by Shawn Levy (The Watch, Date Night & numerous upcoming projects), Real Steel follows the story of a father/ex-boxer and now loser robot fight jockey Charlie (Jackman), who suddenly finds himself lugging around his 11-year-old son through his robot boxing ventures. During the ventures, his son Max (Dakota Goyo) gets caught up in the robot boxing business himself and through the story, we watch Charlie dealing with his own issues while he and Max slowly start to get to know each other. Other cast includes Evangeline Lilly, Kevin Durand, and the man who will be The Falcon in the upcoming sequel, Captain America: The Winter Soldier, Anthony Mackie. Though this movie looks like a pure sci-fi future tech "Rock 'em Sock 'em" robot movie, there's much to the story with the characters behind it all and this movie meets both popcorn movie enthusiasts goals and has a touching, dramatic theme in the background. If you get a chance, check it out if you haven't already. Real Steel is a rare gem of a movie. Don't forget star Hugh Jackman has more fun flicks coming up. His latest dramatic piece, Les Miserables came out during Christmas and has The Wolverine (July 2013), Prisoners (Sep 2013) and X-Men: Days of Future Past (Jul 2014) coming up soon. Dakota Goyo can be seen in the upcoming movies, Dark Skies (Feb 22, 2013) and Noah (March 2014). Evangeline Lilly is banking her money and only has the upcoming two movies from The Hobbit coming out. Anthony Mackie has a few projects in the works. Anthony Russo's Captain America: The Winter Soldier (Apr 2014), Runner,Runner (Sept 2013), Michael Bay's Pain & Gain (April 2013), The Inevitable Defeat of Mister and Pete (Jan 25, 2013) & A Many Splintered Thing. My favorite typecast bad guy, Kevin Durand will be in Dark Was the Night, The Mortal Instruments: City of Bones (Aug 2013), Devil's Knot and Noah (Mar 2014).